Top administrators offered advice to students during Sunday’s convocation. Schapiro delivered a notably less emotional defense of safe spaces, and Holloway discussed the controversial legacy of Thomas Jefferson. 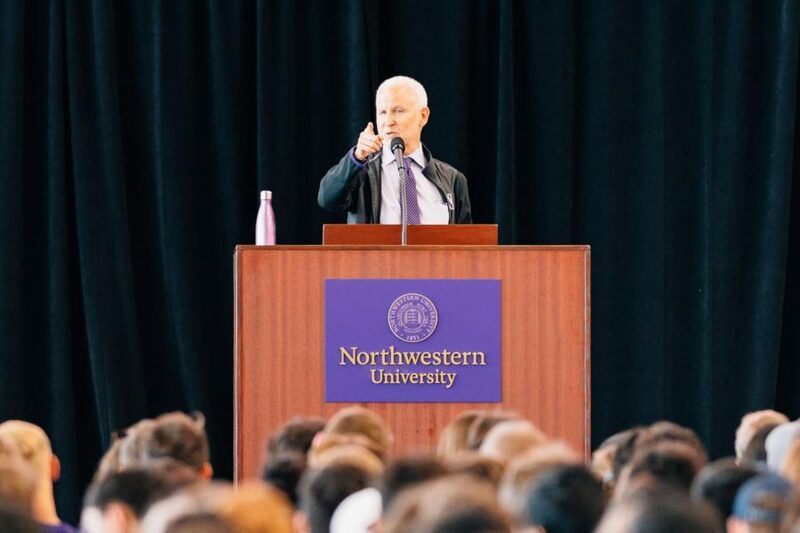 Top administrators welcomed new students to the Northwestern academic community Sunday at its annual president’s convocation, just one of a series of orientation events organized for Wildcat Welcome. President Morton Schapiro, speaking to roughly 2,000 first year and transfer students in the Ryan Fieldhouse, again went in defense of safe spaces. He later walked back some of his comments, but stood behind his basic argument in various op-eds and interviews with several media outlets, including with The Daily Northwestern and the Wall Street Journal. Last year, Schapiro delivered another heated speech in which he blasted Fox News and conservative commentators for what he called a misunderstanding of younger generations. This year’s speech was notably quieter, but he did briefly mention the conservative-leaning news network. Schapiro also defended the University’s “AND is in our DNA” marketing campaign, which highlights students’ varied involvement but has come under criticism for what some say is an endorsement of overextension. Schapiro, a labor economist, said some of his favorite courses were ones outside his academic discipline, adding that a diverse coursework could make students more attractive to employers. While speakers offered advice to new students and encouraged them to support one another, Provost Jonathan Holloway stayed true to his academic background when he discussed Thomas Jefferson’s controversial yet mixed legacy as a president, egalitarian and slaveholder. Holloway went on for over seven minutes before revealing his true purpose for retelling the unveiling of Jefferson’s ancestry and history, which required the work of academics from various backgrounds. Advice to students wavered from academic to more social: don’t only make friends with people like you, listen to yourself and each other, and challenge yourself to understand beliefs that may be in conflict with your own. At one point, after proudly noting the development of new buildings during his tenure as president, Schapiro encouraged students to participate in intramurals, adding that the new Ryan Fieldhouse would not be limited to just varsity and club athletes. Patricia Telles-Irvin, the vice president for student affairs, asked students to seek out support systems and to offer that support for others. The statements come just over a week after Telles-Irvin highlighted mental health and wellness resources in an email sent to families of students. That email came as current students have increasingly expressed concerns about the availability of mental health resources on campus. During Sunday’s convocation, Schapiro announced an unspecified amount of additional funds to Counseling and Psychological Services, and Telles-Irvin encouraged students to listen for students who may be struggling. “We’re here trying to create a community of care,” she said.